Discussion in 'Trek Tech' started by Bill Morris, Aug 9, 2009. I know the image needs fixing, but first I'm concerned about labeling. I know there's a disruptor cannon in the beak. The nacelles are obvious enough, and there seems to be a tractor emitter where a bird's turd emitter would be. What else? Where are the bridge, impuse, torp launchers, shuttlebays, etc., etc.? Where's the singularity? And what is all that stuff already shown (taken from a Romulan display screen)? Probert's "Refit At Station Grey" shows the shuttlebays as being in the lower hull half. Thanks. That's one I had forgotten to go back and check. 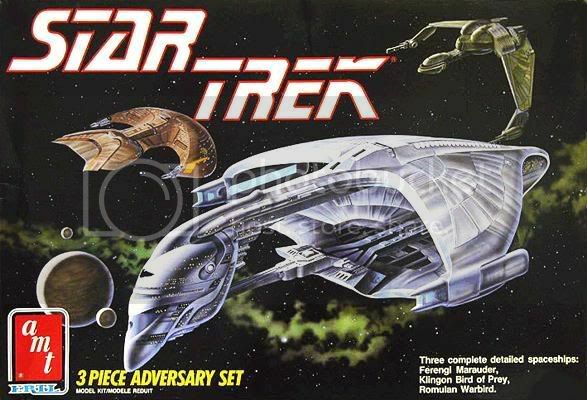 The main references so far are this Romulan display and the exterior side view in the Star Trek Encyclopedia, rather than the slightly different one from the Fact Files, from which nearly all others on the Web seem to have been copied. 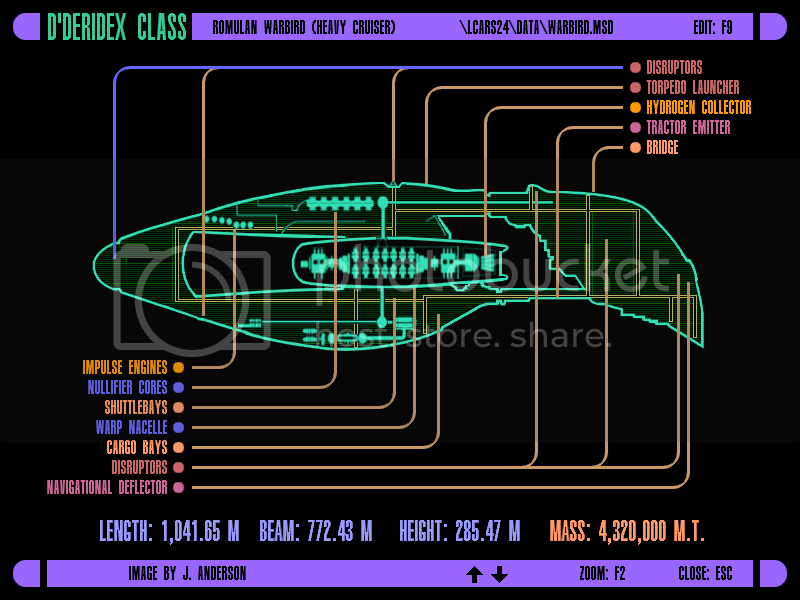 The one accessed from the thumbnail on the Romulan Vessels list of the EAS Starship Database has one like this, too, which is useful for this little project. I remember seeing a diagram a few years ago that showed the singularity, among other things, but now searching isn't producing the clues I need for this thing. Well, it depends: do you want to label features as used on the show or as they were intended? They have weapons firing from the navigational deflector. Anyway, Andy Probert once told me what many of the features were intended to be, and I made the following. It's possible I got the nav deflector confused with the thing up above the bird symbol on the head. I'll ask him. Thanks, DS9Sega. That's a big help, making this look more doable. I still don't know about the bridge, impulse engines, singularity containment, and even shuttlebays, really, since they don't stay where we see them in that painting when the ship is in flight, one would think. And I should have a better-looking figure pretty soon. I've never been able to figure out any rational reason for that design. Sure it looks cool, but why the two hulls? What's in them? Why split the hull like that? How are the decks shaped? Why the giant void in the middle of the ship? makes no sense. "Contagion" shows a bright white glow from the underside of the ship when our heroes comment that her photon torpedoes are being armed and then disarmed (by the virus). It's basically on the exact opposite side of Probert's intended dorsal launcher. Quite possibly both dorsal and ventral launchers exist, but are considered secondary armament because no shot has ever been fired from either one. The shuttlebays from Probert's painting sound like a fine location, especially considering how the Warbird in "Improbable Cause" reeled the runabout in with a ventral tractor beam. This is only speculation of course, but maybe the large void actually contains the artificial singularity. Thats plausible I guess. If the singularity is bending light around that section of the ship, it could make it invisible. But then the ship would look different from different angles. There would be no consistency of design. Assume the cargo bays are the shuttle bays, as in the TMP refit where one led into the other. If Andy intended there to be other bays, the hatches would be obvious. He said the model in missing impulse engines because it was the last ship he designed and he had very little time and never got around to drawing the back, and Greg Jein never thought to add any when he built the model. IIRC there were supposed to be a pair of impulse exhausts vertically stacked along the very back end of the ship, on the aft end of the vertical structure connecting the top and bottom hulls. Interestingly enough, I recall the blueprints for the Playmates warbird identifying the disruptor banks as the little notches on the ventral hull (the boxlike structures best visible in the dorsal view above) along with the tail mounts. Well, assuming AP designed this with GR's warp drive rules in mind, the opening's necessary for the nacelles to "see" each other. Presumably that has to do with Probert's rule that two warp nacelles need a direct line of sight. That's why the Ferengi marauder has a concave belly -- the nacelles have a direct line of sight. ^^^It also has to do with the "technology unchained" idea, that you can design cool looking ships because the technology is a given. Thank, guys, for the additional information. I thought about the line of sight, too, but then there are all those ships that don't have it, from Zephram Cochrane's Phoenix to the Raven. Since the process got rushed for TNG production and no impulse exhausts are seen, they could be on the underside of the upper wing, inside the large opening and on each side of that central aft structure, since it's the driver coils that matter with impulse, and the exhausts are just to vent by-product, nothing to do with Newton's Third Law. And about the large opening, it looks like a good place to clamp down a captured enemy ship, rather than towing it with tractor beams, in which case the "head" might swing out of the way left or right if necessary to allow entry of a large starship, assuming those two large tunnels between main section are hinged that way. Besides, Vulcan ships have a large ring, and nobody complains about wasted space. Also, if the Warbird were crippled and upable to limp home under its own power, four shuttles clamped to the flat deck in that cavern perhaps could at least get it moving. In conjuction with figuring out the impulse, etc. of the Warbird, I also have this one to touch up and label, which I obtained from a zany Cardasian who claimed to have downloaded it from a Romulan computer, although I have been advised to question its authenticity, that he's considered "a FLAAAAAKE." Yes, but those weren't designed by Probert. As I noted, it was Probert's rule that two warp nacelles need a direct line of sight, not Eave's or Sternbach's. Yes, but it sound like a cool rule. To me, this picture sort of clarifies where the bridge is (since it has an adjacent readyroom and conference room, etc. ), well as what's going on in that large area between the wings and nacelles, where shuttles come and go and can ride elevators between that large platform and shuttlebays in the center part of the lower wing. So I've blocked in the schematic and will draw stuff in once I've got a final version of the labeling. And I gave it a new outlilne. ^Hey, I had that model kit. I miss my Romulan warbird and Ferengi marauder. Not so much my BoP, because I quickly ruined the delicate disruptors by playing with it. Nope--a singularity of that size would burn intensely bright during evaporation. Does anyone have an idea what the "vertebrae" on the warbird's "spine" are meant to be? They could be escape pods, but they'd be really huge escape pods for such a massive vessel. And, purely looks wise, they remind me of SLBM launchers. -The bridge is above the bird on the front of the ship. And I don't see a problem with the space in between. That ship is basically two ships in one. May be the wings need to be curved to help with the warp geometry, which, when you put two hulls together, give you a large space in the middle, plus it makes the ship larger than it is. It's still huge though.